Here's a guide and tips on how to evolve Heroes and farm Evolution Materials for your Heroes in Bloodline. Each Hero has different Star levels, with the lowest being 1 Star and the highest being 5 Stars. Heroes with empty (grey) Stars can be evolved to become more powerful. The empty (grey) Star icon/s indicates that the Hero can be upgraded to that of a higher Star level through evolution. For best results, it is recommended to focus on Heroes that can be evolved up to 3 Stars Max, higher is better. - Note: Heroes with more Stars have higher level limits, statistics, skills and equipment. - Hero has reached MAX Hero Lvl. - Required Materials and Gold for Evolution are available. - Refer to our Hero Leveling Guide HERE. - To check you Heroes' next Evolution Materials, go to Hero > Evolve Hero > Select a Hero > Evolve Window. It's a good idea to farm them once you Hero/es are close to their Max Lvls. - As you play through the game, you can unlock and gather some Evolution Materials from the start. - From the Evolve Window, you can tap on the Evolve Material that you need to open the "How to Obtain" screen. If the stage is available, go and farm them, if not, then you need to unlock more plots and stages to make them available. - Vital Fantasy: Drops EVO Mats, available every Wednesdays, Saturdays, and Sundays. Aside from the Evo Mats, some materials should be gathered as well to Evolve a 3* Hero or higher. 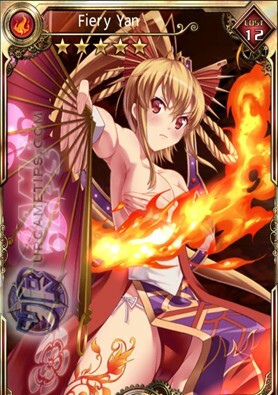 - Slimes, Elves, Elements are commonly used to evolve Heroes. - A Duplicate Hero is a common requirement to evolve most 3* Heroes, and all 4* Heroes. - Evo Mats are easy to farm, Heroes however will take some time, depending on the Hero to be evolved. Refer to the "How to Obtain" screen under Evolve feature to learn how to get them. - Note: Some Heroes will require other Heroes other than Slimes and Duplicate Heroes. How to Get Specific 3* Heroes? - Evolve their 2* version to 3* Hero. - You can also farm 3* Heroes from dungeon stages at higher Lvls, if available. - Trade or redeem Hero Fragments in the Divine House (Village). In the Fragment Trade screen, refer to the How to Obtain info on how to farm them. How to Get Specific 4* Heroes? - Evolve desired 3* Hero to 4*. - Trade Crystals in the Divine House (Village) if the Hero you are looking for is present. - There are various ways to get Crystals, but the only way to "farm" them is by Selling 3* Heroes that you don't need to get more Crystals. 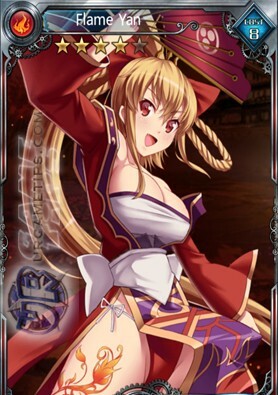 - Note: 4* Vampire Lilo.I is only available by completing Collection Tasks. How to Get More Magic Dust? - Challenge Stages: Go to Village > Warehouse > Tap on Magic Dust > Check available Challenge Stages where you can farm. - Vital Fantasy (Event Dungeon): Also drops Magic Dust upon completion, available every Wednesdays, Saturdays, and Sundays. - Arena Honor Trade(Squad Lvl 15): Honor Points can be traded for Magic Dust (optional). - Vampire Sanctuary (Squad Lvl 20): Chance to get from after battle chests. *At higher Evolutions, Magic Dust will be replaced with Illusion Dust. Farming is the same as above but only at higher Lvls and Stages. *Watch out for other Rewards from Events, Tasks, Freebies, and more. Evolving is pretty pricey, especially for F2P players, so plan well. It is recommended that you only Evolve Heroes that can be upgraded to at least 3* Max, higher is better. *So if you want to upgrade 2* Heroes to 3*, to farm Crystals, then get ready to burn Gold. 3* Heroes will give you 3 Crystals each when sold. How To Get More Gold? - Other than the usual Battle Rewards, here's some notable sources of Gold. - You can get a handful of Gold from here as you gather more stars for the Chapter rewards. - Check available rewards via the Quest screen (plot map). - Just by completing the dungeon, the Gold reward is pretty good. - Drops Gold Mats, available every Mondays, Wednesdays, Fridays and Sundays. Sell them to get a handful of Gold. - Just roll the dice and hopefully you will land on a Gold spot. - Every Monday at Midnight, depending on your guild's completed steps, all guild members will get additional Gold rewards. - Defeat all enemies to get more GOLD from after battle chests. - Hit the [+] button next to your Gem and Gold info to open this option. - This is optional, trade 10 Gems for Gold once a day (more if you are VIP). This will also complete the "Purchase Gold" Daily Task that will give 10 Stamina and 20 Squad EXP. - Only if you don't need them and if they are easy to farm. Go to Village > Warehouse > Sell Items. Sell unwanted items but reserve some, just in case you'll need them later. - Trade Honor for Gold if you want, and if you don't need the other items offered. *More can be obtained from Sign-in Rewards, Tasks, and other event freebies like Facebook Invites via "Friends" section. *The Hero's Element, Lvl, Equipment, Potential Stats, and Job Change will NOT change. OK, let's move on to the lesser ones Haha. - After Evolution, a Hero's Star level increases by 1. - Heroes with more Stars have higher level limits, statistics, skills and equipment. - Card Number increases by 1. 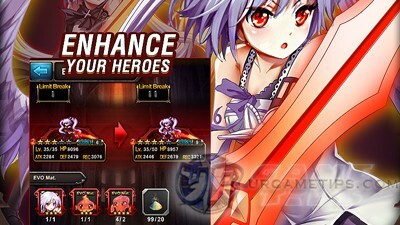 - The Cost of the Hero will also increase, so before evolving your Heroes, make sure you have enough Squad Cost Limit. You can increase Squad Cost Limit by leveling your Squad Lvl. - The Lvl cap will be lifted to a higher one, and attributes will get buffed. - PWR of the Hero will also increase. ULT Skill Lvl Resets to 1! - ULT Skills will reset to Lvl 1, so if you have a Lvl 3 ULT Skill, it will go back to Lvl 1 after evolution. - Now this is different, so if your hero can still be evolved easily, better do so first before pumping up your Skill Mats to your Heroes. - If evolving a 3* or 4* Hero to 5* is gonna take some time, then it's ok to pump some Skill Mats to make them useful. Limit Break Resets to 0! - Limit Breaks will reset to 0, so if you have 1 active Limit Break of [ I I ], your Limit Break will become [ I I I I ] after evolving, resetting all active Limit Breaks, but adding more slots. - If your Hero has a Limit Break of [ X ] before evolving, then you don't have to worry about this. - Will be covered on our next page HERE.